gorgeous picture, it tasted gorgeous and that’s what counts. way or ate a hybrid dish my dad used to make from Craig Claiborne’s NYT Cookbook that he called “Poulet Morengo Chicken Portuguese” (catchy huh?) I hated it. night we cooked the second one and it was a poultry revelation. straightforward enough, and hard to mess up. hour. Took it out and dried it off. oil/garlic/basil mixture all under the skin. Saved some for later. this looks great! Just bought some Maine farm chickens and will absolutely try this recipe. This looks fantastic! I have also always been unmoved by chicken. This looks like something I will have to try. I think that looks beautiful! The first time I saw a recipe that called for spatchcocking, I panicked! But it’s really not difficult to do. Perfect, Ronnie — let me know what you think. Erin, do try it. But get a good bird to begin with. Lydia — I ALWAYS learn something from you. “Spatchcock” is a word that had never come my way before, but I love it. AMAZING is what I think. Made this chicken last night exactly as you wrote about it and it was to die for. This looks and sounds delicious! I’m sure the olive oil/garlic/basil mixture added great flavor to the chicken. I’m a big fan of indirect heat for grilling. I’m only puzzled by the skin-side-down direction. Roasting it skin side up allows the fat in and under the skin to pass over and through the meat as it’s rendered, adding flavor and juiciness. Sounds like that wasn’t needed, though. I was puzzled by the skin down grilling recommendation myself, Terry, but such is my poor record with chicken that I decided to follow the recipe exactly, and it was great. In Cooks Magazine the ATK people always explain why they do something (and why it is better than all the other things they tried) but in the cookbook they only give the best method they found. Ah, the recipe sounds good, but must give much of the credit to the chicken’s home base: the Schacht Farm. I became “accidentally” acquaited with them at the Bloomington Market when I was drawn to their site by the beautiful wool they were selling. So happens they were having a farm day, and so I visited their sheep shearing day and saw their turkeys and chickens on pasture. So good with the right chicken, and the leftovers make incredible salad/sandwich/hash/soup. Not that there will be any — it’s usually just me eating, but I could see a family of four finishing off the whole thing. 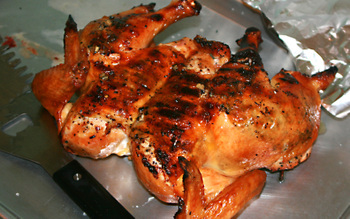 Your picture makes this chicken look mouth-watering. I have brined my turkey, but have never tried a chicken. Thanks for the inspiration! I think your chicken looks delicious! I think it’s NICE picture ! My husband LOVES barbeque, so I’ll have to try this next time we BBQ some Chicken. Spatchcocking is a superb technique – the bird cooks very quickly because the surface area of the carcass is doubled, and it’s very easy to ring the changes with different flavours. I’ve marinaded a spatchcocked chicken in a Moroccan style yoghurt dressing with cumin, cilantro and a little chilli before grilling it off. Absolutely delicious.